The Windmill Hill Pinnacle Association, Rockingham Conservation Commission, and Bellows Falls Historical Society are co-sponsoring two different programs on May 12 that are free and open to the public. Participants can choose either walk or both because the location and timing are meshed to coordinate. 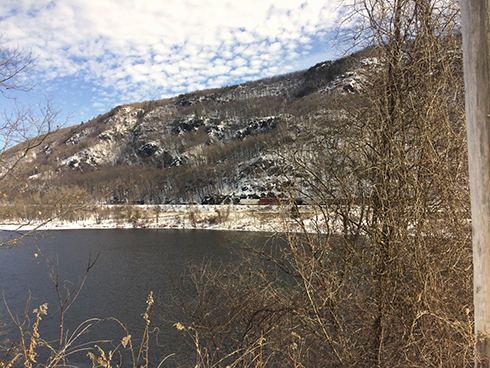 Birding along the Connecticut River. On Saturday May 12, 9-10 AM, experienced birders Peter Bergstrom and Paul Wilson will lead a brief bird walk before the longer Saxtons River Valley Trails Initiative Hike that starts at 10 AM. 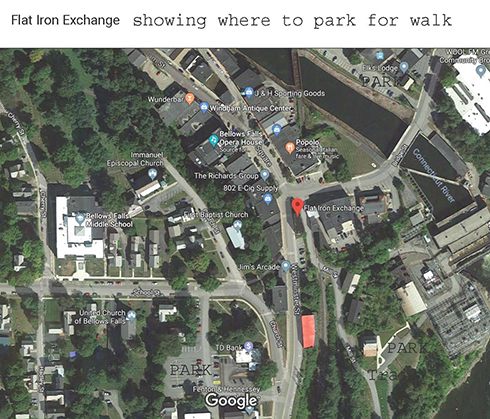 Bring binoculars and meet at 9 AM sharp at the bottom of the hill on Mill Street, whose entrance is next to the Flat Iron Exchange, 51 Square, Bellows Falls. Park in the lot off Mill Street, in the Hetty Green lot behind TD Bank, or in the Bridge Street lot across from the WOOL Building at 33 Bridge Street. See map at right. Saxtons River Valley Trails Initiative Hike. On Saturday May 12, 10 AM-1 PM, rain or shine, there is a hike to introduce participants to the efforts of volunteers involved in the Saxtons River Valley Trails Initiative to create a trail system that can span the distance between Bellow Falls and Saxtons River. This informative walk will follow existing and potential trails to connect the Riverfront Park in Bellows Falls to the Bald Hill Reserve in Westminster. Those interested should meet at the Flat Iron Exchange, a café at 51 Square in Bellows Falls. Park in the lot off Mill Street, in the Hetty Green lot behind TD Bank, or in the Bridge Street lot across from the WOOL Building at 33 Bridge Street. See map at right. Participants will have the option to walk back to Bellows Falls either through the Bald Hill Reserve or via Forest Road in North Westminster to VT Route 121 (Saxtons River Road). Click here for information about other events. Pinnacle is also on Facebook.